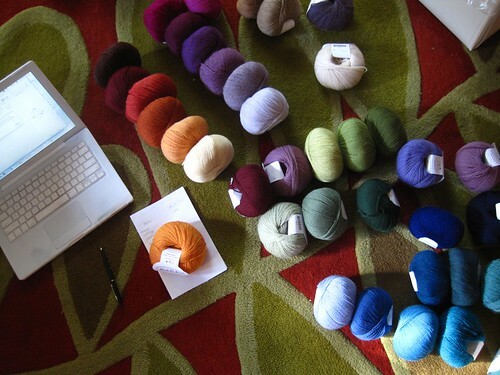 I’m thankful for yarn, and the people I have met because of it. And now, a dinner of delicious leftovers awaits. Some knitting and more food before a return to reality tomorrow morning. Stupid reality. Oh that’s right! It’s a Canadian thanksgiving today, right?! Happy Thanksgiving to you too! I also visit my smaller Palette stash at times. Thinking, thinking….and thankful as well. Fun picture! I have a dream of having one of every color of the knit picks palette. I think it would make a nice art piece on the wall. 🙂 Happy thanksgiving! Happy Thanksgiving Glenna..we have enjoyed our turkey dinner and I am drinking some wine still..guess there won’t be any lace knitting now? Love the carpet..I am still working on a Palette stash. Did you gradually buy one of each color? How does one decide? Happy Thanksgiving, Neighbor! 😀 It sounds like you got to spend in it the best way possible. Happy belated Thanksgiving! Looking forward to seeing you this weekend. Squeeee!!! Love, love, love the yard! Colors are gorgeous. Caught up on your posts today, having a ‘gotta start a pair of socks’ attack after seeing your pic. Having to force myself to finish doing dishrags for the Christmas fair in Nov. and then a Faire Isle hat for me first!